The General Data Protection Regulation (GDPR) makes specific demands on organizations based in and doing business in the European Union (EU). Now several US states are considering similar legislation and California has already passed a GDPR-like law. Clearly this is not solely an EU problem. From a data management standpoint, GDPR presents IT with two challenges. First it has to ensure the on-going protection of data which given the growth of unstructured data is increasingly a challenge. The size and number of files is an ongoing data management problem but meeting the specific demands on retention of discrete files within the data set is a bigger problem. An even bigger challenge comes from the right to be forgotten aspect of these regulations where a user can request the removal of all their data from a backup set. Vendors are working on several potential solutions like delete on restore and isolated recovery zones but each of these creates their own challenges. 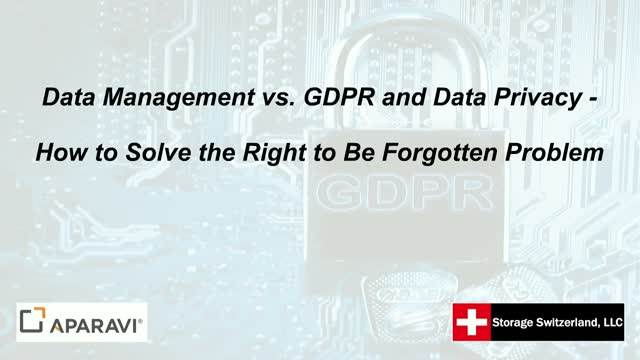 In this live webinar, join Storage Switzerland and Aparavi as we dive deep into the impact of GDPR and similar regulations to data management and the data protection process. The time is now to get prepared to meet the ever-increasing demands on data retention and data privacy.